The iHealthSpot team does much more than create visually stunning websites. We have helped hundreds of medical practices use the Internet to attract new patients, educate existing patients, and streamline operations. The Internet is here to stay, and more prospective patients are using Internet searches to find and screen healthcare providers. iHealthSpot specializes in websites for doctors, dentists, physical therapists, chiropractors, pain management professionals, and more. How can the Internet help you grow and operate your practice? 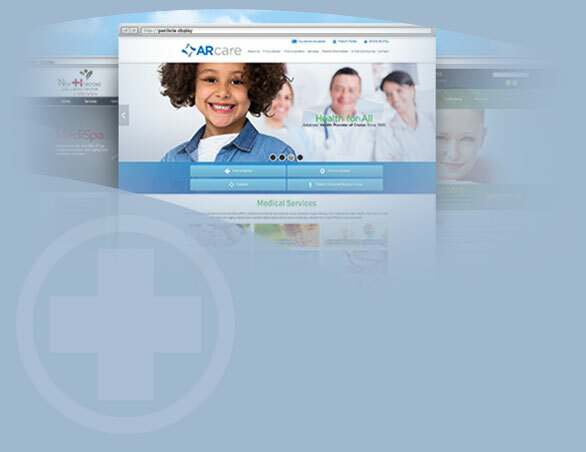 "Highly recommended for affordable medical web site design and related services. They designed some of our web sites including www.maximfacialaesthetics.com, www.cosmeticmedicalpartners.com, www.maximbreastsurgery.com, www.systemiclab.com and have helped us with digital marketing for www.maximhairrestoration.com and www.nationalstemcellcenters.com. Shearly, Chelimar and Megan are very knowledgeable, enthusiastic, and great to work with." “There are so many web development companies out there but in working with iHealthSpot I found their expertise in the healthcare industry to be extremely helpful in the website creation process. It is reassuring to work with a company that already speaks the “healthcare language” and are familiar with creating sites that are patient-driven. I believe this to be iHealthSpot’s greatest advantage. Ancillary; Marketing Manager for Femwell Group Health, Inc.
"It was a dream working with the professional team at iHealthSpot. Procedurally they have everything down to a science. We were able to launch my client’s website ahead of schedule to rave reviews and site traffic results!" "I could not be happier with our decision to have iHealthSpot upgrade our website. They created an engaging site that has captured patients and increased our online appointment requests by 50%! Our practice has added new physicians and services and iHealthSpot always updates our website quickly. The entire team has been great to work with from start to finish!" "Do you LOVE the web site? Because I do. I think it is awesome and I can't thank you enough for working so closely with me and being so patient. Fine job!!!!!!!!!!!!!!!!!" St. Peters Bone and Joint Surgery, Inc.
"The website looks FANTASTIC. Thanks to the iHealthSpot team for a beautiful job!" “We have lots of compliments on the new website. Thanks for being a delight to work with." "Our iHealthSpot website is delivering many new patients every month. We are truly excited at the new business our website is bringing to us, and the iHealthSpot team is always enthusiastic, helpful and responsive to our needs and requests." “When evaluating a website developer I sought a company that promised personal attention, expertise and value. I wanted my website to be unique, not a generic copy of other medical practices. iHealthSpot provided me with a team composed of a writer, IT expert and personal liaison/creative assistant to help me get EXACTLY what I hoped to achieve. We stayed within the quoted budget, finished on time, and the response to the website has been excellent." "Our goal in designing our new website was to increase visibility and accessibility to our GI physicians within our local communities. We knew that in order to accomplish that goal, we had to partner with a company that not only understood the unique attributes of the medical community, but a company that completely understands the internet and how to optimize multiple search engines. iHealthSpot.com is the company we chose to help us achieve our goals. We are thrilled with our professional new website, and the resulting increase in our patient population." Client Account Executive Saddleback Medical Group, Inc.
iHealthSpot has been great to work with since they developed our website. They are quick to respond to our needs, answering questions professionally and making recommendations to keep our site user friendly and technically current. Their staff is highly competent and knowledgeable. With great confidence we would recommend iHealthSpot. St Paul Eye Clinic, P.A. Ready for your very own website? Contact us to start growing your practice today and get online NOW!